The Wooramel Seagrass Bank in Shark Bay is the worlds largest sea grass bed. It is 1030 sq km in area and has taken 5000 years to develop. The Stromatilite community in Hamelin Pool, Shark Bay is the most abundant and diverse microbial ecosystem in the world. The Stromatilites (pictured below right) are microscopic organisms or 'cyanobacteria' that concentrate and recycle nutrients which combine with sedimentary grains to form towers of rock-like materials. These 'living fossils' are 2000- 3000 million years old. 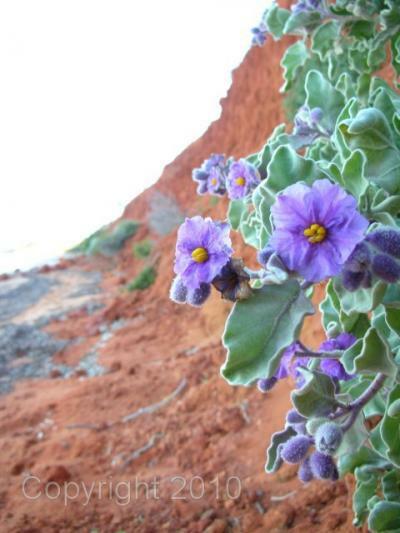 The record of aboriginal occupation of Shark Bay extends to 22,000 years BP. A considerable number of aboriginal midden sites have been found, especially on Peron Peninsula (pictured left) and Dirk Hartog Island. Shark Bay is the site of the first recorded European landing in Western Australia, with the visit of Dirk Hartog in 1616, followed by William Dampier in 1699. Currently Shark Bay has a population of approximately 800, principally located in the towns of Denham and Useless Loop. The economy of the region includes tourism, fishing, mining (salt mine pictured right) and pastoralism. The Shark Bay region is an area of outstanding zoological importance. Isolation of a variety of habitats on and around islands and peninsulas, has produced fascinating marine and terrestrial ecosystems. Shark Bay is renowned for its marine fauna. The region has one of the largest population of dugong in the world, at approximately 16,000. This is approx 12.5% of the worlds dugong populations. The bay was originally named 'Sharks Bay' by the English buccaneer William Dampier in the late 17th century. The name was given due to the large number of sharks caught by Dampiers fleet whilst fishing. Tiger sharks (pictured above right) and other smaller shark species are still abundant, especially during the warmer summer months. Dolphins are abundant, humpback whales use the Bay as a staging post in their migration along the coast. Killer whales and southern right whales have also been sighted. Green and loggerhead turtles are found in Shark Bay near their southern limits. The turtles come to nest on the beaches of Dirk Hartog Island and Peron Peninsula. Dirk Hartog is the most important nesting site for loggerheads in Western Australia. Six species of sea snake have also been recorded. Terrestrial fauna is also of great importance in Shark Bay. The area has 5 of the 26 threatened Australian mammal species. They include the Burrowing bettong, Rufous hare-wallaby, Banded hare-wallaby, Shark Bay mouse and Western barred bandicoot. Over 230 bird species have been recorded in the area. The region supports over a 100 recorded species of Amphibians and reptiles (supporting 9 endemic species). Many species of both bird and herpetofauna are at the northern or southern limit of their range. The Mallee Fowl is a large bird, approximately double the size of a domestic chicken. The male builds a nest or 'mound' to incubate eggs. The mounds are large, using up to 3-5 metres of soil and vegetation. The male guards the nest and protects the eggs, females play no role in caring for eggs. Mallee fowls were once widespread through out the Shark Bay area. Feral foxes, cats and clearing of native vegetation caused populations to decline. In 1997 and 1998 mallee fowl hatchlings were released into the park with the hope of re-establishing a long term viable population. Three mounds have recently been sighted in the park, which confirms that mallee fowl are breeding and new mallee fowl are being produced. Mallee fowl are part of the successful conservation program known as , developed by the Dept. of Parks and Wildlife (DPaW). Faure Island (located in Shark Bay) is a wildlife sanctuary that is run by the Australian Wildlife Conservancy. The Bay comprises a landscape of north-south facing peninsulas, cliffs and islands which separate inlets and bays from each other and the Indian ocean. Shark Bay has an area of more than 2 million hectares, with over 1 million hectares protected in marine parks, marine nature reserves, terrestrial nature reserves and National parks. The Shark Bay region represents a meeting point of three major climatic regions and forms a transition zone between two major botanical provinces. Shark Bay lies about 850km north of Perth, the capital city of Western Australia, and is located on the most western point of the Australian coast. The bay is of international significance, being listed as a World Heritage Site in 1991. Our primary research site located at Monkey Mia, on the east coast of the peninsula. You can find information about how to visit Monkey Mia and the rest of Shark Bay here.